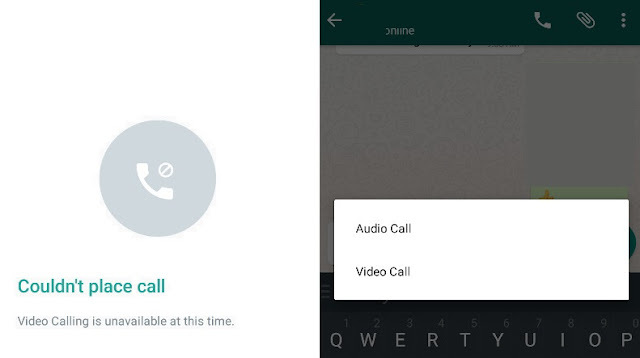 Home » Android , Download , Google Tricks , Mobile » Forget Skype, Now You can Enable video calling feature on your Whatsapp (not a scam)! Forget Skype, Now You can Enable video calling feature on your Whatsapp (not a scam)! Whatsapp is All set for a Big Feature Launch on The New Year. so now as you can see above in the picture every time you push the call button you will see these two options for audio call or video call. so how to start making video calls on Whatsapp? goto the play store, find the beta version of whatsapp here. Beta version and stable version are different things. become a tester and get your update. if you can't install it then go to the setings - personal -security and unknown sources where you have to enable that option. Just install/update the new version and you are ready to go make sure your partner also has updated the new version otherwise you won't be able to make video calls. Forward this webpage with your all friends.